Now they have really gone too far – whoever they may be. Last week, The Straits Times website was hacked. Then the Prime Minister’s Office and Istana websites were compromised. 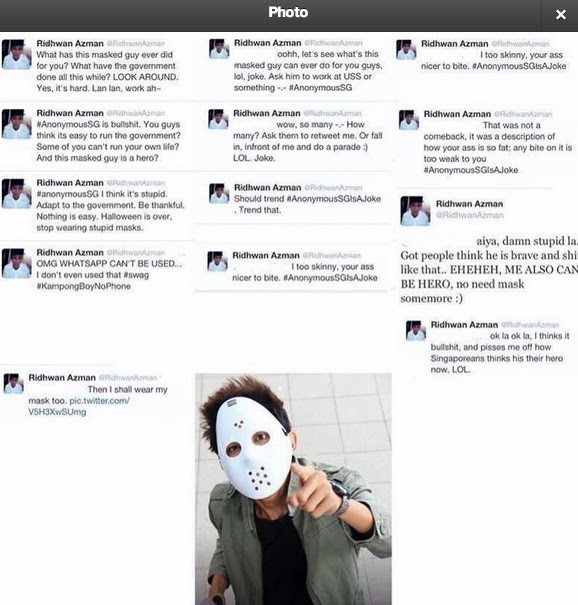 But most shocking of all, Ridhwan Azman’s Twitter and YouTube accounts were hacked. 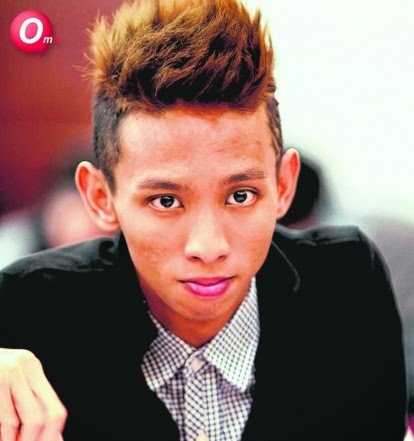 It’s shocking because I had no idea who Ridhwan Azman was. I had to Google him. Being probably the only person in Singapore who didn’t see any one of Jack Neo’s two hugely popular Ah Boys To Men movies, I didn’t know Ridhwan was a “star” of the films. The 19-year-old was also in the news a few months ago for admitting to hitting his girlfriend and has since apologised. Then after he tweeted “Halloween is over. Stop wearing stupid masks” and other taunting insults with the hashtag “anonymousSG”, someone claiming to be anonymousSG appears to have compromised his Twitter account and uploaded a “retaliating” video on Ridhwan’s YouTube channel. So we have The Straits Times, the Prime Minister’s Office, the Istana and a girlfriend-hitting teenage movie actor. Let’s play “one of these things is not like the others”. It seems to me that someone (who shall remain anonymous) might be slumming it with Ridhwan. I recently thought I was a victim of a cyber attack myself. 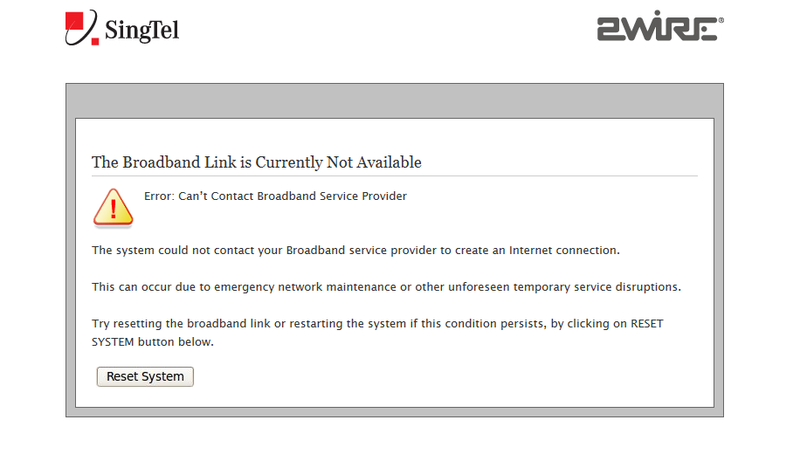 The broadband link is currently not available. Error: Can’t contact broadband service provider. The system could not contact your broadband service provider to create an Internet connection. This can occur due to emergency network maintenance or other unforeseen temporary service disruptions. Try resetting the broadband link or restarting the system if this condition persists, by clicking on RESET SYSTEM button below. The message wasn’t signed. So I guess you can call it an “anonymous message”. After rebooting my computer, I still couldn’t connect to the Internet. I resisted clicking on the RESET SYSTEM button. From experience, I have learnt that clicking on it just leads to more technical mumbo jumbo and more trouble. I waited a few minutes and restarted again, but got the same anonymous message. Oh no, how was I going to join Ashley Madison before the Government blocks it? Had Singapore’s information infrastructure been hacked? Would there be anarchy in the streets? It’s not a protest. It’s a V For Vendetta fan club meeting. 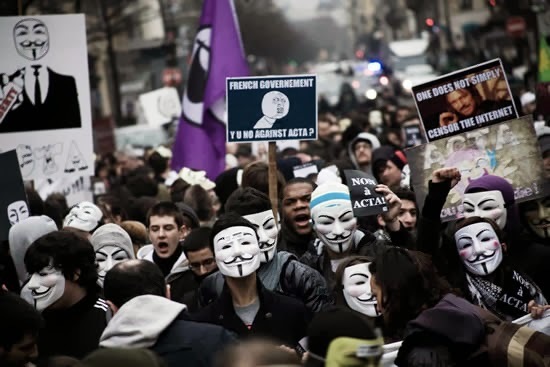 Having seen the 90s movies Hackers and The Net, I imagine that when the hackers pull off their Guy Fawkes masks, they would look like Angelina Jolie or Sandra Bullock. But with my luck, they would probably look like Matthew Broderick from WarGames but even geekier. Well, last week, SingTel revealed who was behind my unavailable broadband link and it wasn’t Keanu Reeves from The Matrix. The telco said that the Oct 9 fire which led to the Internet disruption was “caused by an employee not following strict maintenance procedures, including the use of an unauthorised blowtorch”. Blowtorch? 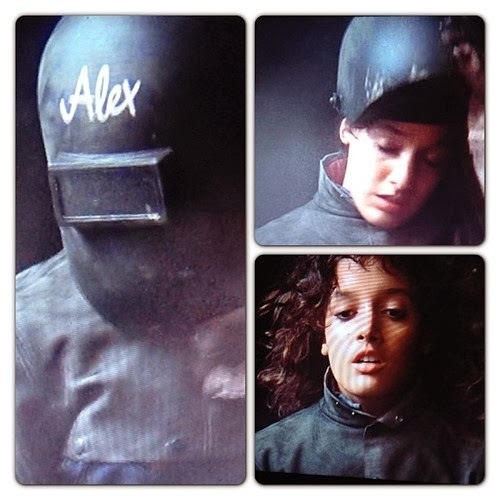 So the culprit was actually Jennifer Beals from Flashdance? But the SingTel employee wasn’t named. I guess we can call him or her an “anonymous employee”. SingTel also didn’t say whether the anonymous employee has been “fired”, pun intended. With this new information, I want to apologise to hunky Kiss92 DJ and book-burning parent Arnold Gay for linking him to the SingTel fire in an earlier column. But if anyone happens to come across an unauthorised welding tool around his house, please let me know. I was, of course, not the only one affected by the Internet outage. More than 60,000 people experienced a disruption in online services over several days last month. I couldn’t access any website, government or otherwise. So while hackers may be legion, it seems to me that the bigger threat to our nation’s cyber-security is one SingTel employee with a blowtorch.